To start 2018 on the best way possible, we do need to share this huge, cracking and massive bundle with you: The Massive January Bundle from thehungryjpeg.com. Retail price when you would buy all the graphics and fonts separately would be $892, but only for this month you can get it for just $29. Buying this bundle will save you $863… imagine how many future bundles you can buy with that! 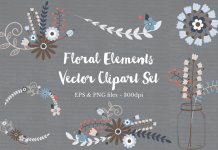 This bundle includes a whopping 83 premium fonts over 42 font families, AND, 1800+ handcrafted graphics elements from 16 gorgeous graphics packs!! Get a HUGE 97% off this amazing collection today — normally priced at $892! As usual a Commercial Licence is included, so you can use it for any project you want.